The Tao of Gini: I saved a plastic tree today. I saved a plastic tree today. as evidenced by yesterdays post. 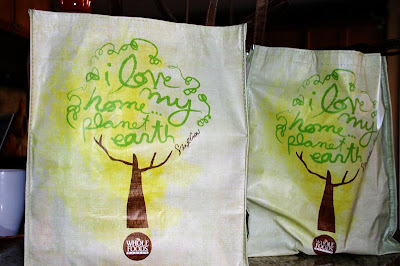 re-usable bags I bought from Whole Foods. and they have been sitting in the back of my truck ever since. Garrin's glad we are doing something to save our earth too! We have reusable Fresh & Easy bags that we always seem to forget to bring with us when we go shopping. But if nothing else, they're super cute - the bags & the boy! "Yay! Good job!" as James would say! 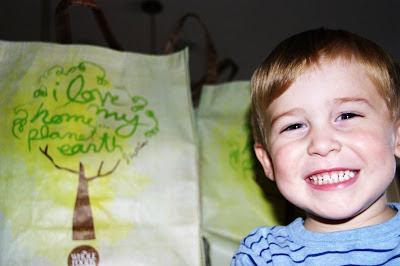 My Whole Foods bags are different - I saw those the last time we were in there and I wanted them. But, I guess it defeats the purpose if you keep buying new ones! I love my Hannaford's bags, especially because they fold up real small and snap closed. Garrin is super cute EVERYDAY! Wish I could afford Whole Foods. Not in my budget these days. Boo hoo!!! Gini and Kimmy, send us some Robusto Cheese, please! Oh yeah, and macaroons! Please don't let me give you the impression I can afford Whole Foods either - I needed Panko, chestnuts, and some crazy mustard Albertson's didn't have. In order to save money - I didn't go near the cheeses (yum) or the bakery (yum yum!!). sorry ! Yum!! I love Wholefoods. We went one time. I spent $75 for one meal and some juice and never went back! now THOSE are cute bags... i want THOSE... mine are boring ugly forest green blahs!